← Happy Birthday, Richard Hunt! 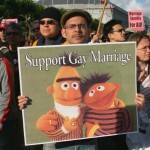 The Bert and Ernie debate has resurfaced in light of the recent interview with former Sesame Street writer Mark Saltzman, in which he talks about writing the pair as a gay couple. If you recall, I’ve already written the definitive analysis of this whole “controversy”, which is even more relevant today. Enjoy! This entry was posted in Richard Hunt and tagged Bert and Ernie, gay, Mark Saltzman, Richard Hunt, Sesame Street. Bookmark the permalink.